When I create dashboards, I like to add as many resources as possible for stakeholders who want more information. And it’s important to make your dashboards as self-sustaining as possible. If you have to be there to walk viewers through your dashboard, you’re going to run into issues because once you loosen your grip on it and send it out into the wild, there’s no telling whose desk it’s going to show up on — or in what for s/he will view it. For internal dashboards, a line item may warrant additional research. 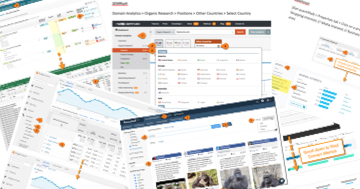 To wit, someone might see a report from a tool like SEMRush (one of my favorite marketing tools) or Google Search Console and want to research it further. To facilitate this research (or even discussion), you can create dynamic links to individual reports. Link to a specific Google Analytics report — e.g., landing page, referral, channel, PPC keyword, etc. You get the idea. Many marketing tools use unique URLs for their individual reports, and any that do can be included in your dashboards to provide easy links to learn more. I start the video off with a simpler example using keyword reports in SEMRush. 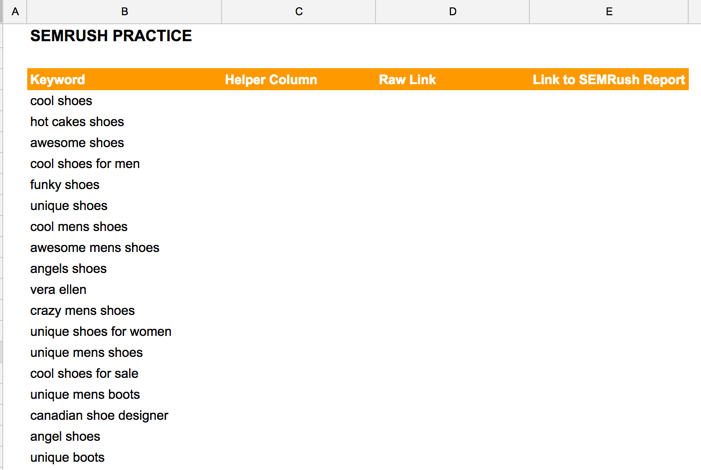 Using a helper column, you’ll learn how to dynamically create a link to the keyword report for each keyword listed that will ultimately look like this: http://www.semrush.com/info/funky+shoes. Also, Google Sheets has a handy feature for creating date pickers that makes this process a breeze for your dashboard users. I show you how to use the TEXT function to convert these dates to the format used in the Google Analytics report URLs. You can get a date picker in Excel, but it’s much more complicated (thanks, Obama). In Excel 2013 for PC users you can use a form control (learn more), or for 2011 Mac users you can use an add-in (learn more). Brace yourselves. This example requires multiple steps. But I walk you through it step by step. If you want to follow along, you can use the practice file I use in the video. If you want to use it for yourself, create a copy by logging in to Google and going to File > Make a Copy. You can view the video below. I’ll warn you: This video is longer than most of mine because I wanted to demonstrate a more complicated example. But if you understand these two examples, you should be able to dynamically generate links to any marketing tool that uses a custom URL to generate the report. For more beastly data visualization tips, check out out my Annielytics Dashboard Course offerings. Wonderful post, and video tutorial. I am working on creating a spreadsheet to track multiple pieces of content across multiple platforms. I want to include these wonderful dynamic links, and variations there of. Is it possible to do all of the work on a workbook, with all the helper columns etc and then have the final pretty See Report appear on another workbook? Is there any way to automate that or does it come down to just a copy/paste of the final value? Yes, it totally is! I demonstrate how to do this very thing using the IMPORTRANGE function in this video tutorial: https://www.annielytics.com/blog/google-docs/how-to-import-one-spreadsheet-into-another-in-google-drive-video/. And it updates dynamically whenever your original workbook updates. You will look like such a badass. Interesting! Thanks for sharing the video and giving us more insights about it. I believe this really works not just to give more information to clients but to your own advantage as well. It one way to organize urls or your own links so you won’t be having a hard time looking for resources if you might need one. Totally agree! Its use is multidimensional. Thanks for the post, Annie! You’re always a help. Hi Annie, thanks for sharing this post on urls. It’s my first time over here and I’m looking forward to reading more articles. Thank you for this wonderful video. I can easily call it a life saver. Thank you again and looking forward to watch more tutorials from you. Literally exactly what I was looking for tonight to generate specific urls based off of a few bits of data for my accounts. Thank you! Thank you so much for such ever simple, clearer and beautiful instructions to make our requirements come true. Really enjoyed this post, i’ll be connected to learn such beautiful things. Thank you for your tutorial. I appreciate the detail you covered.